Raising smallholder productivity starts with strengthening the production and delivery efficiency of agricultural input and service systems. Photo credit: Islamic Development Bank. Although complex and highly variable across countries, the challenges to raising agricultural productivity are well known to the development community: limited access to improved seeds and quality planting materials, low soil fertility and inadequate access to fertilizers (both organic and inorganic), poor access to extension and advisory services, dysfunctional markets, and droughts and floods that may be associated with climate change, among others. What is less well known though are entry points for interventions that can bring systemic and sustainable changes. These entry points will certainly vary from country to country or region to region, but there are three interrelated and promising ones that have been identified. These are increasingly becoming the basis of agriculture and rural development projects supported by the Islamic Development Bank (IsDB) Group (and its development partners) aimed at growing the productivity of agriculture in member countries. Figure 1 highlights entry points for raising smallholder agriculture productivity. It starts with strengthening the production and delivery efficiency of agricultural input and service systems. Quality inputs (improved seeds and fertilizers) are essential to raising productivity (yields per unit area planted) under both the rainfed and irrigated conditions. In addition, strong extension and advisory services are important for enhancing the adoption and efficiency of improved inputs. A case study from Bangladesh is used to illustrate the importance of seed supply systems, an important input to raising productivity. A second and related entry point involves providing support to value chains (led by farmer associations and the private sector) that deliver new technologies, extension and advisory services, and market innovations to farmers, both small and large-scale. This entry point is illustrated using a case study from Nigeria. A third entry point involves regional projects that support the replication of good practices for raising productivity across countries. This is illustrated using the example of a regional smallholder-focused crop production project in West Africa. Increasing access to improved seeds and planting materials as well as fertilizers, is critical to increasing productivity and closing yield gaps. The use of fertilizers is particularly important for realizing the genetic potential of improved planting materials. This is one of the key reasons for the low yields of staple food crops in sub-Saharan Africa where the use of these inputs by smallholder farmers is low. It is important that access to both inputs be developed simultaneously. This is, indeed, the reason behind the success of the Green Revolution in Asia and other countries in the 1970s and 1980s (Pinstrup-Andersen & Hazell, 1985). Strengthening input value chains, therefore, is an important component of IsDB Group’s support to member countries. The Bangladesh case presented next illustrates key interventions made by the public sector in growing the national supply of improved seeds and planting materials. There is consensus among agricultural experts that the high-quality seed of improved varieties is considered the basic input for increasing agricultural output and achieving self-sufficiency in food production. The effectiveness of other inputs, like fertilizer, pesticides and irrigation, depends largely on the use of quality seeds. Research in many countries has clearly demonstrated the value of using quality seeds, with yield increases of more than 15%–20% under farmers’ management conditions (Ambika et al., 2014). The Bangladesh government correctly identified the lack of high-yielding quality seed as a major constraint to increasing productivity and achieving the goal of household food security (Planning Commission, 2011). Across all crops, the coverage of quality seeds in Bangladesh is only 20% (BADC, 2013). The government invested in a national program to improve the production and supply of quality seeds of important food crops, coordinated by the Bangladesh Agricultural Development Corporation (BADC). The 6-year program funded jointly by IsDB and the Government of Bangladesh (from 2011 to 2016) improved farmers’ access to high-quality seeds and planting materials of a wide range of crops: rice, wheat, potato, maize, pulses, tuber crops, oil seeds, pulses and vegetables, among others. The project used an integrated seed value chain approach that addressed the production, processing, and distribution of quality seeds, disseminated appropriate seed production and management practices, and strengthened the institutional and technical capacity of stakeholders, including contract seed growers, producers and traders, agricultural research and academic institutions, private seed companies, regulators, and policy makers. Specifically, the capacity of three major government organizations—the BADC, the Bangladesh Agricultural Research Institute, and the Bangladesh Rice Research Institute—was significantly improved. These institutions increased the supply of breeder, foundation, and certified seeds by engaging private sector growers in seed production and multiplication. They also regulated and ensured the quality of the supplies and built capacity of stakeholders across the value chain. The capacity building program covered nearly 7,000 seed producers and dealers, 26,000 farmers, and around 13,000 researchers and quality control experts. Twelve manuals on seed production, processing, and quality control were developed, updated, and disseminated to stakeholders to provide guidelines to best practices. To complement capacity development, an ICT-based seed quality monitoring system was launched to provide updated data on the market for quality seeds and for forecasting future trends. Taking a forward-looking perspective, major investments were made in finalizing the release of important varieties to tackle the emerging problems of salinity, drought, and flooding. This integrated, forward-looking approach will have wide-ranging benefits in the long run as new varieties are disseminated and adopted. There were also some immediate benefits resulting from the increase in supply of quality planting materials provided by BADC. Within 6 years, the project produced 37,000 metric tons of improved seed and planting materials, including 2,600 tons of breeder and foundation seeds, amounting to 22% of the quality seeds supplied. The project expedited the release of 15 new varieties, including one saline-tolerant and two tidal submergence-tolerant rice varieties, which will be critical to achieving household food security and building smallholder farmers' resilience to shocks. While the accrual of project results will take time, the food production and consumption trends in Bangladesh reflect the impact of the government’s programs (including the quality seed improvement project) on overall food security in the country. The project helped to increase national food grain production from 32 million tons in 2009 to 35 million tons in 2016 for rice, and from 1.3 million to 1.35 million tons of wheat over the same period. A survey of farmers’ fields benefiting from the project indicates incremental difference in yields varying from 7.7% for lentils to 13.9% for potato. These changes are having a positive effect on food security in the country. Increasing crop productivity requires going beyond strengthening the ability of public institutions to improve their production, processing, and marketing activities. Nearly 70% of the farmers in Bangladesh use farmer-sourced seeds, pointing to the need for interventions that both encourage the use of quality seeds from commercial entities, as well as enhance the quality of seeds being exchanged in the farmer-to-farmer system. The latter aspect was lacking in the project. Farmers cannot be encouraged to use the quality seeds without demonstrable financial viability in their use. This in many cases requires the provision of a complete package of production technologies to transform the farming business. The Nigeria case study that follows here demonstrates how integrated productivity improvement interventions (including the use of fertilizers) can complement quality seed supply to have a greater and more sustainable impact. In the mid-2000s, the Federal Government of Nigeria launched a nationwide program for food security in partnership with the Food and Agriculture Organization (FAO) of the United Nations. The objective of the program was to move existing technologies off the shelf and into wide-scale use by farmers and agribusinesses. The goal was to improve national and household-level food security by reducing rural poverty in an economically and environmentally sustainable way through crop productivity enhancement and diversification using a value chain approach. capacity building for smallholder farmers—the majority of them women—to adopt improved technologies. Farmers were trained in the use of good agricultural practices in production and value addition, and then provided with, through their farmers’ groups, “commodity modules” that included inputs, improved seeds, fertilizers, and crop-processing equipment. These interventions proved to be very effective over the 5 years of the project, not only in terms of learning about best practices, but also for technology transfer and adaptation by smallholder households. Farmers benefited from improved agroprocessing equipment and on-farm storage technologies, resulting in a reduction of post-harvest losses by at least 20% on the participating farms. Among the equipment and facilities provided by the project to participating farmers’ groups were 90 metal grain silos, 6 groundnut milling machines, 9 grinding machines, 10 grain threshers, 15 rice milling machines, 2 palm fruit milling machines, 1 cassava processing machine, and 18 grain milling machines. These equipment and improved facilities provided the basis for training and bringing about change in farming practices and related agribusinesses in target regions. 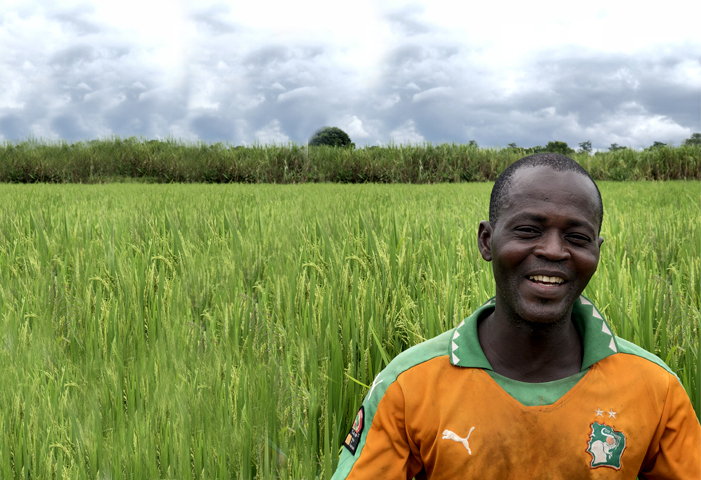 Alhaji Bukar Bida, a smallholder rice farmer in Yobe State, was supported with a rice production module. He successfully completed the Farmer Field School training and implemented all the agronomic practices demonstrated by the project. After he started receiving project technical and financial support, he expanded his initial 2-hectare operation to about 7 hectares in 2013, and he is now cultivating about 20 hectares of rice using the improved variety FARO 44. His farm produced a yield of 8–10 bags per hectare of paddy rice using local varieties, which increased to 15–20 bags per hectare with FARO 44, which was supplied by the National Program for Food Security. In 2014, Bida was able to harvest about 400 bags (100 kilograms each) of paddy rice—i.e., 2 tons per hectare. His farming skills and the quality of inputs he uses have continued to improve, and today his rice yields have reached more than 3 tons per hectare. Although not in the original design of the project, a credit component with simple disbursement, utilization, and cost-recovery mechanisms was introduced to ensure access to needed resources by farmers to sustain their new modes of operation. By the end of the project, considerable progress had been made toward greater uptake of innovations by farmers and agribusinesses. To sustain the gains they made, the communities involved expressed a strong desire for a more sustainable rural credit system in the form of a registered microfinance institution serving their investments and financing needs. The project interventions enabled farmers to achieve substantial increases in average yields, ranging from 45% in lettuce cultivation to 256% in groundnut production (Figure 2). The project contributed to raising the living standards of smallholder farmers in these three states. In Yobe, for example, a medical doctor changed his profession to farming because of the increased profitability of crop and livestock enterprises resulting from the project. The average household income was increased by more than 150%. The project produced 23,096 tons of crops, enabled 10,021 smallholder households to have access to post-harvest technologies and farm mechanization, and increased the number of households practicing improved farming techniques by 95%. A total of 515 farmers groups have been formed, compared to a target of 324. About 100% of the target farmers intensified their crop production and have been farming three crops per year for the past 4 years. The project sites became training grounds for farmers from the three states and beyond. They have, in essence, become platforms to nurture and grow sustainable value chains. The key inputs were improved planting materials, fertilizers, and good agronomic practices. Regional cooperation between countries can be an effective means to leapfrog smallholder productivity gains by sharing knowledge on what works well (and what does not) under different conditions. In 2013, IsDB Group funded a five-country regional program, the Smallholder Agricultural Productivity Enhancement Program for $68.54 million. The project covered Mali, Burkina Faso, Benin, Cameroon, and Niger. The program was developed in partnership with the International Fertilizer Development Center (IFDC) and the Alliance for a Green Revolution in Africa. The regional coordination under IFDC mobilizes and disseminates agricultural research results and knowledge across the countries; and creates specialized national networks across the production value chain that include plant breeders and seed multipliers, soil health experts, input suppliers, and agroprocessors. These networks help to strengthen the capacity of those involved to improve smallholder agricultural productivity. The linkage among these national networks across countries is facilitated by creating knowledge-sharing platforms for effective technology transfer. The program dovetailed with a similar one funded by the World Bank that also intervened in some of these countries (World Bank, 2016). A strong focus of the program was scaling up innovations that could improve the low soil fertility conditions faced by smallholder farmers, a major problem in much of sub-Saharan Africa. The program supported the wide-scale use of micro-dosing technology across three countries where it is most appropriate: Burkina Faso, Mali, and Niger. This is an agronomic practice that entails the placement of small amounts of fertilizers (including farmyard manure if available) into the planting holes (or at the base of growing plants) as opposed to broadcasting (Fatonji et al., 2016). It allows farmers to increase fertilizer use efficiency in low- to medium-rainfall areas (500 to 800 millimeters per annum). A challenge presented by this technology is the labor required to apply it, so the program addressed the problem by introducing the use of mechanized planters that were developed by the National Agriculture Research Systems in Burkina Faso and Mali (Fatonji et al., 2016). The regional program facilitated wide-scale demonstrations aimed at creating broad awareness of this technology, which was already on shelf across the project countries. 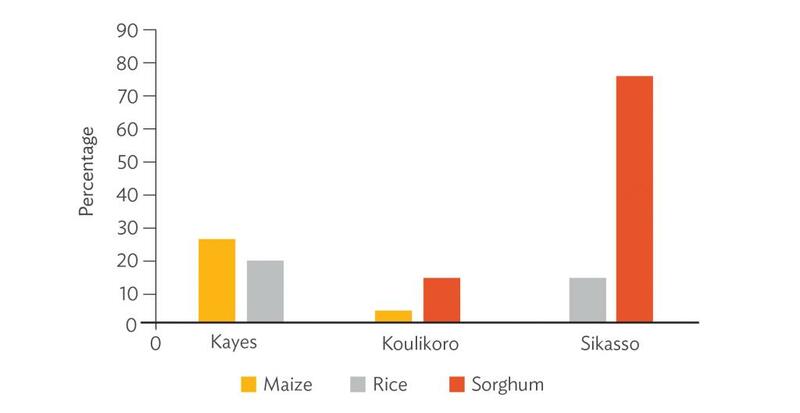 The value of using improved seeds, among other good agronomic practices (including soil fertility management), was demonstrated to highlight the enormous potential yield gains under farmers’ conditions which, for example, reached 31% for maize and 90% for sorghum in Mali (Figure 3). Such awareness creates demand for quality seeds and fertilizer from commercial companies, and this demand was further catalyzed by support from the program to map the soil fertility status of participating farmers. This increased demand has encouraged the development of private-sector fertilizer companies to supply appropriate blends for the different sites and crops. The introduction of quality seed and mechanized micro-dosing has provided significant yield and financial benefits. In the case of Burkina Faso, it has increased the production of staple food crops of smallholder farmers by 141%, decreased labor costs by 32%, and delivered a five-fold increase in the net benefits accruing to farmers (Figure 4). It is essential to put in place policies to regulate the quality of inputs. If not in place and enforced, farmers can be exposed to fake seeds, low-quality fertilizers, and crop protection chemicals from those who want to cash in on the growing demand for inputs. The private sector should be considered an important strategic stakeholder at all three-entry points. Particular attention needs to be paid to seeds and fertilizer companies that are critical to sustaining project impacts. They can also increase coverage through innovations such as ICT applications. Although the private sector was engaged in all three case studies presented, the level of participation should have been greater. The inclusion of affordable financing schemes is essential. This was a missing component in all projects except the Smallholder Agricultural Productivity Enhancement Program. In the case of Nigeria, a credit or revolving fund was introduced midway in the project at the request of the participating farmers and agribusinesses. The case studies presented here have highlighted three strategic entry points that can be used for interventions aimed at growing smallholder agricultural productivity and rural development in general. They provide practical platforms for exploring useful innovations and building strategic partnerships. Their use should, however, be governed by country- and region-specific circumstances. Nevertheless, they provide a good framework for IsDB’s agriculture and rural development support to its member countries as they strive to improve the productivity of smallholder farmers and move toward achieving Sustainable Development Goal 2 (Zero Hunger) by 2030. S. Ambika et al. 2014. Review on Effect of Seed Size on Seedling Vigour and Seed Yield. Research Journal of Seed Science, 7: 31-38. Bangladesh Agricultural Development Corporation. 2013. Annual Report for the Financial Year. BADC, Ministry of Agriculture 2012-13. D. Fatonji et al. 2016. Taking Fertilizer Microdosing to Scale in the Sahel. In: Going Beyond Demos to Transform African Agriculture: The Journey of AGRA’s Soil Health Program. Nairobi, Kenya: Alliance for a Green Revolution in Africa. Islamic Solidarity Fund for Development. 2016. Ninth Annual Report 1437H (2016). Jeddah, Kingdom of Saudi Arabia. P. Pinstrup-Andersen and P.B.R. Hazell. 1985The Impact of the Green Revolution and Prospects for the Future. Food Reviews International, 1(1), 1-25. Islamic Development Bank Group Planning Commission. 2011. Accelerating Growth and Reducing Poverty. Part 2: Sectoral Strategies, Programs, and Policies. Government of the People’s Republic of Bangladesh Sixth Five-Year Plan, FY 2011-2015. Dhaka, Bangladesh. World Bank. 2016. The World Bank, West Africa Agricultural Productivity Program. (Accessed 6 March 2018). World Bank. 2018. The World Bank Data, Cereal Yield (kg per hectare). (Accessed 6 March 2018). As lead specialist, Dr. Jama is involved in developing sector policy, global good practice knowledge products, and strategic partnerships. He has worked with Alliance for a Green Revolution, United Nations Development Program, World Agroforestry Centre, and Ministry of Energy of Kenya. He has conducted research and published extensively on innovations for enhancing agricultural productivity and food security; fertilizer use within the framework of integrated soil fertility management; water management technologies for smallholder low-input systems; and strategies for drylands resource management and conservation. He joined IsDB in 2010 from the Food and Agriculture Organization of the United Nations. His research interests include smallholder productivity, smallholder technology uptake, and farmer-market linkages. He is an agriculture economist by training. An agriculture engineer with a Master of Sciences in Management of Mediterranean and Tropical Agrifood Systems (ENSIA FRANCE), he has been managing agro industrial projects, and leading feasibility studies on food industries and agro industrial units for tropical regions. He supports the Vice Presidency and the Complex in enhancing the efficiency and effectiveness of the country programs of IsDB based on its decentralized business delivery model. He has worked on such issues as organizational efficiency, governance, portfolio management, and sustainable development. He was a senior economist at IsDB’s Agriculture and Rural Development Department for a decade, working on issues related to smallholder farmers, food security and resilience, community driven development, and value-chains.